Alexandra Clancy is a performer, choreographer, and teacher based in Vancouver with a love of dance and a passion for tap. Growing up, she trained at Danzmode and the Vancouver Tap Dance Society’s youth company – Tap Co, developing her skills in all genres of dance. She was an apprentice/understudy for the prestigious Tapestry Dance Company’s 25th season performing and touring across North America. She has attended and performed at multiple tap festivals such as DC, LA, NY, Chicago, and Vancouver. Alexandra was privileged to train extensively, learning from tap masters such as Dianne Walker, Jason Samuels Smith, Derick Grant, Dormeshia Sumbry-Edwards, Chloe Arnold and many more. Alexandra is a proud alumna of the first tap program held at the iconic Jacob’s Pillow, and auditioned and returned a second time for another intensive two weeks. Alexandra had a role in ‘The Cholly Project’ directed by Travis Knights, and was grateful to dance in Lisa La Touche’s tap dance show titled ‘Hold On’. She was given the opportunity to perform in a Tri-Tone Productions show, founded by Tasha Lawson, as both a solo artist and in an ensemble working closely with musicians. She performed at the Kennedy Centre in DC as part of the inaugural first full-length tap show. She is thankful to have danced in many of Danny Nielsen’s shows, most recently at the Scotia Dance Centre in the Discover Dance Series. Alexandra has a unique voice blending both tap and contemporary dance and looks forward to continuing to share her adoration of dance while teaching and performing both locally and internationally. Andrea Williams is pushing the boundaries of flamenco expression one small step and one small stage at a time. Andrea is the director, producer and principle choreographer for “Raíces y Alas Flamenco” (Roots and Wings), an experimental flamenco project in Vancouver. Founded in 2010, it’s mandate is to respect the traditions and techniques of flamenco (roots) while exploring and pushing the boundaries of its creative expression (wings). She began her love affair with the art form in St. John’s, Newfoundland, developed her technical base in Vancouver, and furthered her studies and performance opportunities in Canada, the USA, Greece and Spain. She has been the recipient of grants for Professional Development and Productions through the BC Arts Council and the Canada Council for the Arts. The smallest ambition in Farnaz Ohadi’s life is to live it as grand as possible. While growing up in her native land of Iran, Farnaz sang at every possible opportunity but longed to find her authentic artist’s voice. Upon her move to Canada, she studiedOperatic vocal training, Persian folk singing, then flamenco can’t through the instruction of Oscar Nieto, Vicente Grieg, Naike Ponce and Lucas Ortega among others. Farnaz’s love of music and performance art inspired her to create the collaborative project “Mashregh Ensemble” in 2012, that combines Persian poetry with Flamenco music. Susana Abreu's singing career began in Caracas, Venezuela at the age of 13 when a professional band began rehearsing in her apartment building's basement. The group of musicians let her sing one day for a laugh - only to hire her on the spot after recognizing a natural, powerful voice. From there she began singing everything from folk music to rock and roll while writing her own music and learning to play drums, congas and guitar. By the time she was 15, Susana was playing 4 nights a week at local nightclubs while going to high school during the day. By 22 she had one of the hottest acts in the Caracas nightlife, where people lined up around the block to watch her perform her unique mix of Latin and Anglo pop and rock. In the meantime she did back up vocals for famous Latin singers like Venezuelan artists Frank Quintero and Kiara, and Puerto Rican singer Johnny Rivera. In 1998 Susana left Venezuela and immigrated to Canada. She has since released LATIN ROOTS (2004), her debut album, a collection of her own lyrics and music. Her Vancouver credits include the Vancouver International Jazz Festival and the 2010 Winter Olympics. Susana can be regularly seen performing in and around Vancouver with Goma Dura and as a solo artist. Traditional Japanese classical dance. Fujima School. Colleen Lanki is a theatre performer, director, choreographer, educator, and lover of total theatre. She was based in Tokyo for many years studying nihon buyoh (Japanese classical dance) and noh, and working in contemporary theatre. She is the Artistic Director of TomoeArts, a company that specializes in Japanese performing arts and the creation of new dance-theatre works. Colleen is currently working on her PhD at the University of British Columbia. Recent projects: directing KAYOI KOMACHI, a new chamber opera combining noh and classical music, creating/performing the interdisciplinary performance piece WEAVER WOMAN. DIAMONDS IN THE ROUGH are based out of Vancouver, Canada and founded in 2009. The Diamond ladies have a strong presence in the choreography industry and freestyle community. This sisterhood of powerful women represent more than a dance crew, their chemistry and lifestyle allows them to support each other, express, create and motivate. Karen Flamenco will be performing different traditional style flamenco dances throughout the Summer Series. In 2008, the Karen Flamenco Studio opened in the heart of Mount Pleasant. This airy studio loft serves as Karen’s headquarters where she teaches over 150 flamenco enthusiasts, rehearses with the Karen Flamenco Dance Company, and creates her feisty dances. The Karen Flamenco Dance Company has become well known for their interpretation of stories such as: "Moulin Rouge", "Sleeping Beauty" and "Swan Lake" told through flamenco dance. This year the company will take on the musical "West Side Story". Karen is very thankful to Fiona for inviting her to perform at this year's Calgary Flamenco Festival. SUSAN NASE is a Scottish highland dancer, tap dancer, and singer from Vancouver, BC Canada. She is a co-founder of Shot of Scotch, a professional premier level Scottish highland dance performance troupe with branches in New York City and Vancouver. Under Susan’s artistic direction, Shot of Scotch Vancouver strives to create new and exciting contemporary dance pieces with a high standard of technique, while also remaining true to the deep roots of the centuries-old art form of Scottish Highland dance. Her passion is to connect through culture and dance, to learn and be reminded that it is a small world after all. HARDEEP SAHOTA is the General Manager of Royal Academy of Bhangra and the First Certified Bhangra Instructor in Canada under the CTDA (Canadian Dance Teachers Association). Through Royal Academy of Bhangra, he has raised the bar for bhangra institutes, bringing a professional and strategic structure to teaching and showcasing Punjabi Folk Performing Dance Arts, not only in Surrey BC, but on provincial, national and international stages. Hardeep Sahota has participated, judged, coached and produced Bhangra events and festivals all over the world since 2008. Love & Gratitude to all of the exceptionally strong and generous dancers involved in this process. Thank you Krysin Clarke for your guidance and devotion. Thank you Small Stage for the opportunity. ASHLEY SWEETT is a versatile dance artist who has had the joy of training and working professionally in the dance industry for the past 15 years. She was raised in Langley BC with a passion and dedication for the performing arts. After graduating as a dance major from The Langley Fine Arts school, Ashley continued her commercial training with Source Dance Company before studying contemporary dance with Modus Operandi under direction of David Raymond and Tiffany Tregarthen in Vancouver. She later moved to Los Angeles to continue her dance training while attending The Second City ‘Conservatory’ program for improv acting. Ashley founded Sweett Moves in 2013 which has given her many opportunities to collaborate, create and perform dance works for Dancing On The Edge, Small Stage, Robson Street Business Association, Little India music videos and more. She has choreographed and taught pre-professional dance programs such as Lamon Dance Company, Source Dance Company, Helix Dance Company and The Cecchetti Society of Canada .Ashley has had the pleasure with working alongside choreographers such as Kelly Konno as assistant choreographer for FOXTV’s Lucifer TV series and choreographer for the 2010 Winter Olympics Celebrations. She was both a dancer and assistant choreographer to Jen Oleksiuk for Netflix’s ‘Adventures of Sabrina’ and to Geneen Georgiv for Hey Ocean’s music video for “ A Song About California.” Her production credits include working as a rehearsal director for Small Stage 36 with choreographer Heather Dotto, producer/artistic director of ‘Bated Breath’ and ‘Sweett Moves Summer Jam’ as well as Artistic Director for The Lover’s Cabaret alongside Vanessa Young. She has an array of theatre, film and television performance credits including Netflix, Small Stages 35 (Heather Dotto), Disney (Paul Becker), Nickelodeon (Kelly Konno), Times of India Film Awards (Liz Tookey), Alliance Films, One Drop Foundation, MUCH MUSIC, Michael Buble, Goldwell Hair, and PRP Productions. Ashley currently resides in Vancouver BC where she thrives as well-respected choreographer and dance teacher. She has been active in the teaching community since 2003 both locally and abroad. For the past 6 years she has adjudicated throughout Western Canada as well as in Australia. MARISA CHRISTOGORGE is born in Vancouver, BC, Marisa began her training at The Richmond Academy of Dance under the direction of Annette Jakubouski. She has trained at several North American companies such as The Canada's National Ballet School and Boston Ballet. Marisa received her post-graduate training from the San Francisco Conservatory of Dance from artists such at Summer Lee Rhatigan, Christain Burns, Alex Ketley, Tristan Ching, Marlie Couto, and Courtney Mazeika. During her time in SF, Marisa had the privilege to preform repertory by William Forsythe, Ohad Naharin, Alex Ketley, Courtney Mazeika, Summer Lee-Rhatigan, Christian Burns, Bobbi Jene Smith, and Tom Weinberger. DEVAN GENEREUX is a Vancouver, BC native and emerging professional dance artist. She cultivated her love for dance at a young age and her multifaceted background includes extensive training in ballet, contemporary, improvisation, modern, jazz, and hip hop. Upon graduation, Devan pursued her training at Lamondance under Davi Rodriguez, Lara Barclay, and Monica Proença. During this time, she had the opportunity to represent Canada as a soloist at the IDO World Championship of Dance in Frankfurt, Germany as well as traveling to Brasilia, Brazil to perform in Barakah (Lamondance) at the International Dance Seminar of Brasilia. Following her training in Vancouver, Devan moved to Toronto to further peruse her passion at The Conteur Academy where she has trained under recognized artists Eryn Waltman, Sheona Bell, Kelly Shaw, Ryan Lee, and Colleen Snell, to name a few. Devans unique strength and connection with the floor and her dance partners have allowed her to begin a successful professional dance career. Her notable credits include performing in 5inco (Lamondance), Human (Lamondance), Frames (The Conteur Academy), Fill In The Blanks (The Conteur Academy), and most recently, Scaredy Cat (Small Stage). MEGAN HUNTER is Co-Artistic Director of WAREHAUS dance collective, and actively creating works both in collaboration with WAREHAUS and independently. Through WAREHAUS, Megan has been mentored and performed works by Vanessa Goodman and Desiree Dunbar. WAREHAUS has performed original works presented by Dance Allsorts by New Works Dance Management, Small Stage, OURO collective, To.Be.Announced, Sweet Moves, Cascadia Film Festival, and Shadbolt Centre for the Arts and Dezza Dance. She had the privilege of training sessionally at the Toronto Dance Theatre and in partnership with Dancemakers. Megan is the honoured recipient of the Grant Strate Award in Dance in 2014, from Simon Fraser University, upon her graduation. She is currently performing and rehearsal directing with Kinesis Dance Somatheatro. Megan was invited to New Brunswick in April 2017, to create and perform a new work in collaboration with musicians, Andrew Reed Miller and Emily Kennedy, under mentorship from Lesandra Dodson. WAREHAUS travelled to Toronto in 2017 and 2018 to present choreography by Vanessa Goodman and WAREHAUS for New Blue Emerging Festival. Megan presented a new work created in residency in Veretz, France and performance in Festival Dansez Maintenant in 2017. BROOKE WILLIAMSON is born and raised in Vancouver, Brooke Williamson began training professionally with Arts Umbrella under the direction of Artemis Gordon and Lynn Sheppard in 2013. During her time there, she had the opportunity to work with James Kudelka, Crystal Pite, Francisco Martinez, Walter Matteini, Francesca Carotti, and Lesley Telford among others. Brooke has continued her dance training at Springboard Danse and Movement Invention Project. After being cast in the film “Centre Stage: En Pointe”, she has begun to venture her studies into the world of acting- both at Vancouver Acting School and with Jeb Beach and Associates. Brooke has had the pleasure of dancing for Rockridge Dance Theatre, Heather Myers, and Enfuse Entertainment among others and was assistant choreographer to Jeff Dimitriou for the 2016 Cultural Architect Awards. Brooke is thrilled to be performing in her first Small Stages project! HANNAH HENNEY first entered the dance scene in a Port Coquitlam studio at the age of 3 years old. She is a well rounded and strong performer, teacher and choreographer. She has specialized in Hip Hop and Tap but has trained in many styles from Locking, Waacking and Popping to Musical Theatre, Jazz and Contemporary. Hannah has worked on many film/television productions this year from Disney’s Freaky Friday and Netflix’s Series of Unfortunate Events to National Geographic's new mini series Valley of the Boom. She’s also dipped her toes into the acting world and is inspired to see where this new passion leads. Hannah is a very sought after, and experienced teacher. She is an engaging instructor in Tap, Jazz and Hip Hop. She loves connecting with the youth and sharing her knowledge and experience with the upcoming generations. She has choreographed and performed in many showcases all over North America. She was invited to choreograph a few pieces for Dances For a Small Stage 33 and 37 the Valentines editions. Hannah is so excited to be back collaborating with her crew and performing a solo for Small Stage’s Summer Series! Her fire, passion and positivity always shine through whether she is on set, performing on stage, choreographing or in a studio with her students. She can’t wait to see where this exciting career will take her next. HARDEEP SAHOTA was born and raised in Punjab, India and was initiated into the dance form of Punjabi Folk Dances from a very young age. He quickly realized that he had a passion for the art form and spent a decade mastering the fundamental rhythms and movements. Hardeep has participated in bhangra competitions and events across the globe and won many prestigious competitions. Steppin’ is an energetic, knee slapping, toe tapping contemporary Métis jig solo. Musically driven by the fiddle’s undeniable force, the impulse for movement is sparked like a flint that ignites fire. With electricity of the jig and fancy steps that rebound off the earth – for a moment in time, milliseconds before you return to earth you are propelled in the direction of spirit, like a horse running in the open wild. It is a celebration of the joy of movement, the healing in dance, the significance of heritage, and the love of Métis culture. Steppin’ moves through time weaving between histories; mirroring Métis Cultural traditions against contemporary dance influences, I search to harmonize with a sense of belonging while referencing my identity as a contemporary Aboriginal person. Jeanette Kotowich is a Vancouver based, mixed blood Métis, professional dance artist and choreographer. She holds her Bachelor of Fine Arts from Simon Fraser University, BC. Jeanette creates work as an independent dance artist & choreographer. She is currently creating a full-length, innovative collaborative performance called Valley, co-directed with senior Maroi artist, Charles Koroneho (Te Toki Haruru). She has self-produced and performed two solo works in the past, Eloise (2017) which has been performed in BC and Saskatchewan and Steppin’ (2015) which has been performed on more than 20 stages across Canada, including BC, Ontario, Saskatchewan and the Yukon. Jeanette has worked with Vancouver based dance artists Tara Cheyenne Friedenberg, Su-Feh Lee (Battery Opera), and Deanna Peters (Mutable Subject). She is a seasonal company dancer with Dancers of Damelahamid, Raven Spirit Dance, and V’ni Dansi. Jeanette co-ordinates for the annual Coastal First Nations Dance Festival, is a member of the Full Circle First Nations Performing Arts Ensemble, the Indigenous Performing Art Alliance & a founding board member/secretary for Savage Society. Honoring her mixed Métis/Cree and European heritage (originally from Saskatchewan) as a source of inspiration and reference point in her work, Jeanette is passionate about investigating a blend of contemporary and Indigenous practices. Jessica Jone was born in Vancouver, and received her early dance training from Lorita Leung. She later went on to train professionally in Chinese classical and folk dance at the Beijing Dance Academy, and the Guangdong Dance School in China. She is also a graduate of the contemporary dance program at Simon Fraser University. Jessica is an accomplished dancer and seasoned performer who has won many awards for performance and choreography, including the Chairman’s Award at the Fourth Peach and Plum Dance Competition in Beijing, and two Best Choreography Awards at the North American Chinese Dance Competition. Jessica is Principal and Artistic Director of Lorita Leung Dance Academy and Artistic Director of Lorita Leung Dance Company. She is also a much sought-after guest teacher throughout the Lower Mainland who has taught master classes at Simon Fraser University, the Dancers Transition Resource Centre, the Canadian Dance Teachers Association, Goh Ballet Academy, the Dance Centre, and the American Chinese Arts Society in Boston. She is Canada’s first Senior Teacher of the Beijing Dance Academy Graded Dance Examination Syllabus. In 2012, the City of Vancouver’s Parks and Recreation Board named Jessica as one of its Remarkable Women in the field of arts and culture. In May 2015, Jessica received the Outstanding Women of BC award from the United Global Chinese Women’s Association of Canada. Chengxin Wei graduated from the Beijing Dance Academy in 1997, where he studied classical Chinese dance for eleven years, and received his Bachelors of Fine Arts degree. He is a former principal dancer of the Guangdong Provincial Dance Theatre, and since 2000, he has appeared with numerous Canadian dance companies including Ballet British Columbia, Anatomica, Company Erasga, EDAM, Judith Marcuse Projects, Joe Ink, the Lorita Leung Dance Company, Mandala Arts and Culture, MovEnt, and Wen Wei Dance. In 2004, Chengxin co-founded Moving Dragon, a contemporary dance company that focuses on cross-cultural fusion between Eastern and Western dance styles. He is the 2007 Iris Garland Emerging Choreographer Award recipient, and the 2009 recipient of the David Leighton Arts Fellowship Award from the National Arts Centre in Ottawa. Chengxin hold his MFA degree in dance at the University of Washington, where he was awarded the 2010 Art Fellowship Challenge Grant. From 2012-2014, he was a Visiting Assistant Professor at Ohio University’s School of Dance. Chengxin has taught as a sessional instructor at Simon Fraser University’s School for the Contemporary Arts and is currently on faculty at Arts Umbrella and Lorita Leung Dance Academy. Natasha is a rare talent that has managed to excel in the professional dance industry, while building a well known and respected reputation in the underground dance community across Canada, and around the world. Co-founder of the powerhouse female crew “Diamonds In The Rough” based out of Vancouver. As a group, they have travelled throughout the USA and Canada to battle, perform and train. Natasha loves to freestyle and share with her community. She is passionate about training and is constantly broadening her vocabulary in dance. Knowledge is key. Fluids a new work created by Vanessa Goodman in collaboration with the performing artist Bynh Ho and Stephanie Cyr. Using biological themes to explore ways of being in conversation with each other. Special thank you to Julie-anne and her team for always craving out new interesting spaces to share. Vanessa is attracted to art that has a weight and meaning beyond the purely aesthetic and uses her choreography as an opportunity to explore the human condition. She was the recipient of the 2013 Iris Garland Emerging Choreographer Award and the 2017 Yulanda M. Faris Program from the Scotiabank Dance Centre. She co-founded The Contingency Plan collective, where she interpreted new work from Justine A. Chambers, Rob Kitsos, James Gnam and Serge Bennathan. Vanessa has been collaborating with Small Stage as an associate artist since 2015. Independently Vanessa has danced with dancers dancing, plastic orchid factory, Julia Sasso, Wild Excursions Performance, Jennifer Clarke Projects, dumb instrument dance, Mascall Dance, Holly Small and Judith Marcuse. Her work has been presented locally by DanceHouse, SFUW, The Firehall Arts Centre, The Dance Centre, The Chutzpah! Festival and The Shadbolt Centre for the Arts; nationally by Kinetic Studio and The Dance Made in/Fait au Canada Festival; and internationally by On the Boards, Risk/Reward Festival and The Bienal Internacional de Dança Do Ceará. 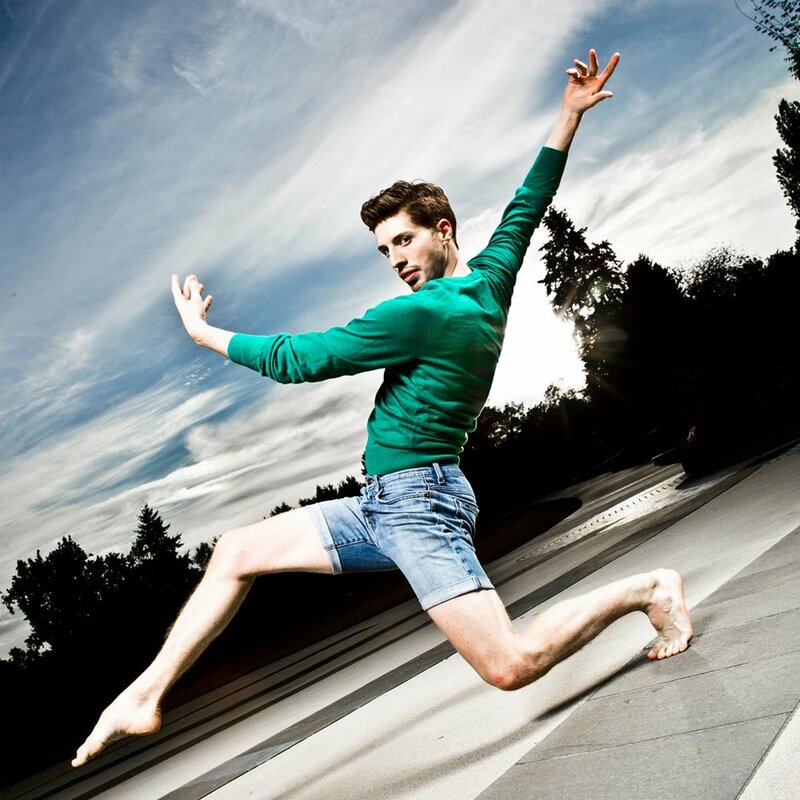 Goodman has been commissioned by Lamon Dance, Warehaus Collective, Modus Operandi and The SFU rep class. Bynh Ho is an independent dance artist, living and working on the unceded territories of Musqueam, Squamish and Tsleil-Waututh First Nations. He began his formal training with Modus Operandi before going on to receive his BFA from The Juilliard School. Bynh has had the pleasure of dancing in works by Pina Bausch, Ohad Naharin, William Forsythe, and Sharon Eyal & Gai Behar, among others and has worked with companies, including BODYTRAFFIC, Inverso Productions, and Company 605. Most recently, he was engaged in research for Kidd Pivot, directed by Crystal Pite. Bynh own works have been recognized with Choreographic Honors by The Juilliard School and presented by TOES For Dance, in New York and across Ontario. Bynh is thrilled to be collaborating with Action at a Distance Dance. Stéphanie Cyr is a graduate of the Arts Umbrella graduate program and is currently a freelance dancer based in Vancouver. She has worked and performed with Lesley Telford | Inverso, Andrea Peña & Artists (Montréal), imPerfect Dancers Company (Italy), TWObigsteps collective, Serge Bennathan and Action at a Distance, among others. She has also participated in the Movement Invention Project, Springboard Danse Montréal and the Creative Gesture at The Banff Centre.